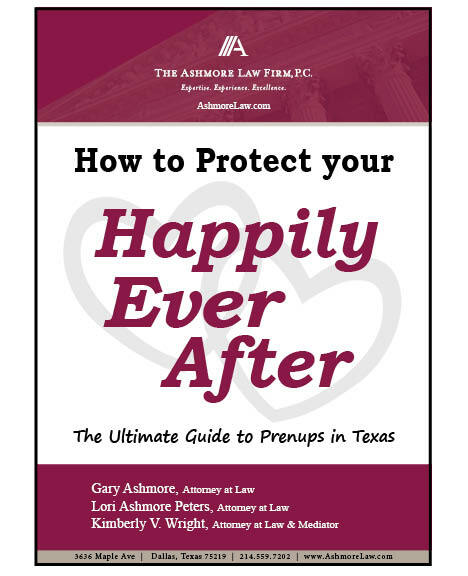 How to Protect Your Happily Ever After - Free Book | The Ashmore Law Firm, P.C. ?Can a Prenuptial Agreement be Modified After Marriage? ?It is best to sign a Premarital AND Postmarital Agreement? ?What is a Property Agreement Between Spouses? Do You Need A Prenup? Are you getting married and live in Texas? Do you want to protect your assets? Do you have children from previous marriage? If you have answered "yes" to any of these questions, you can benefit from a prenup. The Ashmore Law Firm, PC provides high quality legal services to residents of Dallas, Texas and surrounding areas.